Can Delphie Beauchamp, a Texas born research librarian fresh from a break-up with her two-timing boyfriend, help best friend and newly elected Chief of Police Em Landry, solve a double homicide in the old Mystery Bay Cemetery? Chief Landry needs Delphie's help in solving the murders, along with determining why specific graves from the early eighteen-hundreds have been vandalized. 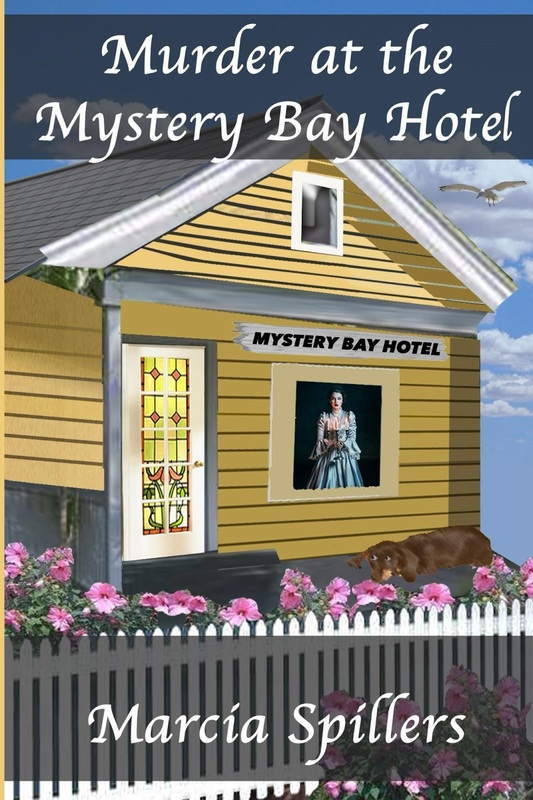 Her canine best friend in tow, a twenty-two-pound dachshund named Huckleberry, Delphie heads for the tropical island of Mystery Bay, Florida where she begins a journey that includes a pinch of gold, a touch or romance, and a wallop of ghosts, in a race to solve the mystery, of the Mystery Bay Hotel. The smell of the ocean, crisp and briny like a jar of pickles, held just a hint of murder in the air. I picked up my luggage from the small carousel inside the terminal and opened the glass door of the Mystery Bay International Airport. The sultry, mid-October sunshine hit me all at once, along with the sweet fragrance of the red, frangipani trees that bordered the edges of the sidewalk. Amazing how paradise was just a plane ride away. “God, what a beautiful day.” I dropped my suitcase on the pink-hued coral sidewalk and pulled out my sunglasses. Before I could slip them on, Huckleberry, my twenty-two pound, red Dachshund whined for me to take off his winter sweater. Poor little guy. The outfit worked great for the chilly October weather in central Texas but not the south Florida humidity. “Sorry, Huck.” I unhooked his leash and pulled off the sweater. Stretching out his long body, Huckleberry trotted over to the nearest hibiscus bush and hunched over. Seconds later he sighed in relief. I coughed and fanned the air. Guess he wasn’t that hot in his sweater after all. 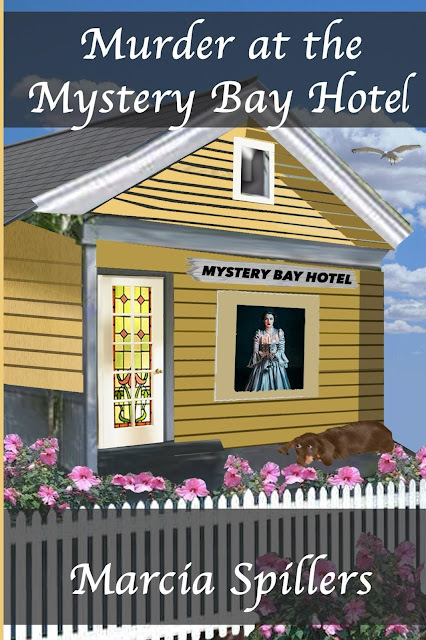 As soon as I started reading Murder at the Mystery Bay Hotel, I felt like I was in south Florida. The author certainly knows how to set a scene! It was such an easy read, I was able to sail through it in no time at all. A little cheesy at times, this book was quite predictable but maintained a little mystery throughout. The main character was such a hoot, and I enjoyed her interaction with her 'love interest' although I thought she trusted him a little too easily a little too soon. One of my favourite aspects of the story was the appearance of the ghosts - I do love a hint of supernatural and there was just enough to catch my attention. I would have loved to know more about these ghostly personalities though - perhaps a sequel (or should I say prequel?). All in all, it was a quick and enjoyable read. 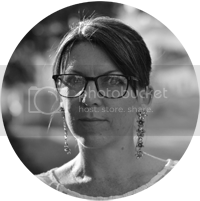 Marcia Spillers has been a Librarian/Archivist for more than twenty years. 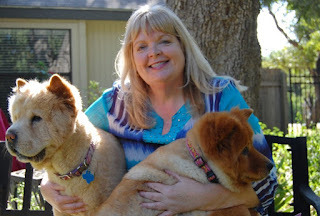 Currently a school librarian, she lives in Austin, Texas with her two chows, Bella and Susie Bear. Marcia spent seventeen years in south Florida perfecting her writing skills, along with completing the Writer’s Program at UCLA.